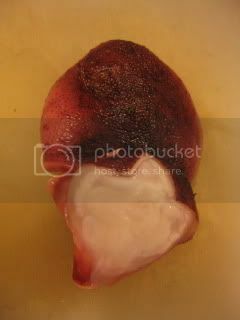 I picked up a boiled octopus head from Marukai in Gardena. Sake lovers love octopus head, as it has deeper (more acquired?) flavor than octopus legs. It was about 10 oz. I cut it into small cubes and set aside. I came up with the recipe while I was driving back home from Gardena. I decided to use my versatile microwavable donabe steam-roaster, TOCHINSAI, to cook the octopus. It's a very simple recipe and for this recipe, I don't use the grate. JUST ASSEMBLE INGREDIENTS AND COOK IN MICROWAVE. In the skillet of Tochinsai, I first drizzled about 1/2T sesame oil, spreaded sliced shiitake mushrooms (about 6 medium-size), cut okra (about 6-7), some minced ginger and garlic. Then, put the cut octopus head on the top. 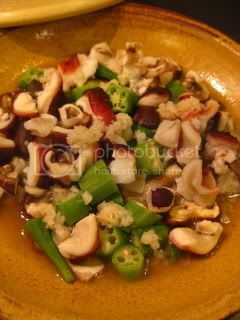 Over the octopus, I drizzled about 2 tablespoons dashi stock and 1 tablespoon shio-koji (you can substitute shio-koji with 1/2T soy sauce). 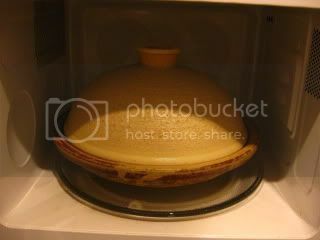 Meanwhile, I soaked the lid in water for a few minutes and drained (so that the lid absorbs moisture and gives nice steaming effect during cooking). Tochinsai skillet was covered with lid and heated in the microwave (700-watt) for 5 minutes. Then, it was rested for a few minutes (with the cover on). Voila! 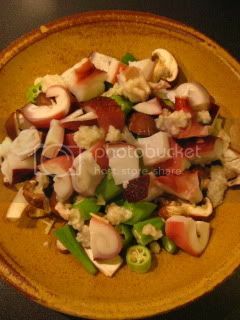 The quick steamed octopus dish was ready. I lightly stirred the ingredients and finished with thinly sliced cilantro+scallion and some drizzle of my homemade chunky la-yu (hot oil) on top. The aroma was exquisite and the flavor was so rich. You just wouldn't believe it was cooked in microwave in just 5 minutes! Amazing.